As you celebrate St. Patrick's Day, raise a Guinness to the Irish captains who keep their heritage proudly on display all year long! Get the backstory behind some of the more popular Irish boat names. An Bradán Feasa translates to "Salmon of Knowledge." In Irish mythology, the Salmon of Knowledge is an ordinary salmon that ate nine hazelnuts which had fallen into the Well of Wisdom, and in doing so gained all the world's knowledge. The lore followed that the first person to eat the Salmon of Knowledge would in turn gain this knowledge. For seven years, an Irish poet tried to catch the salmon. When the poet caught the salmon, he gave it to a servant with to cook it with strict instructions not to eat any of it. The servant cooked the salmon as told, but when he burned his finger on the fat, sucked on it to ease the pain. When the poet realized the servant had received the wisdom of the salmon, he gave him the rest of the fish to eat. The servant gained all the knowledge of the world and throughout his life could draw upon this knowledge by biting his thumb. The term "banshee" is derived from the Irish bean-sidhe, which translates to "woman of the fairy." In Irish lore, the banshee is a spirit whose appearance and cry forewarns of imminent death. The banshee may also be spotted by a river, washing the blood from the clothes of the soon-to-be deceased, and passers by can ask her the name of the person who is to die. They are also allowed to ask the banshee three questions, but only after she has asked the passerby her three questions. The song The Wild Rover is considered a staple among stereotypical Irish music, although its exact origins are unknown. A rowdy singalong, it tells the tale of a young man who has been away from home for many years, and upon finally returning home visits his favorite pub. The pub refuses him credit until he presents the gold he earned on his travels. He sings of how his days of roving are over and he intends to return to his home and settle down. Sláinte translates to "good health,' and derives from the Old Irish word slán, meaning "healthy" or "safe." In Irish Gaelic, the response to sláinte is sláinte agad-sa, which translates "to your health as well." Slán itself can mean "farewell" when used as a noun and "goodbye" as an interjection. Selkies are mythological beings capable of changing from seal to human form, and are said to be cursed with a constant longing for what they do not have: when in selkie-form swimming in the sea they yearn to be on land, and when on land as a human, they long to be in the sea. An Faoilean translates to seagull and Iolar na Mara to Eagle of the Sea. 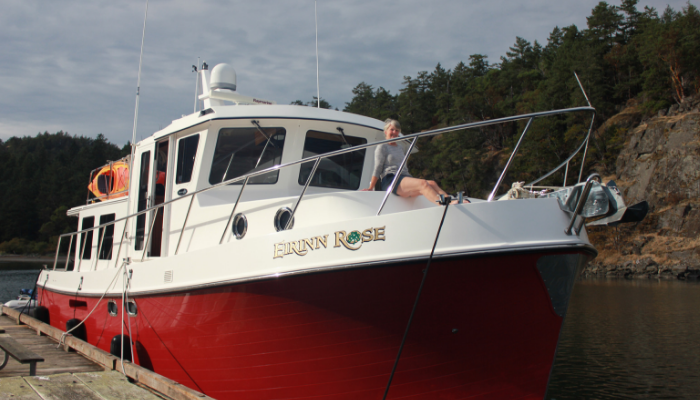 For boaters who prefer a tongue-in-cheek boat name, Tinneas Farraige translates to seasick. 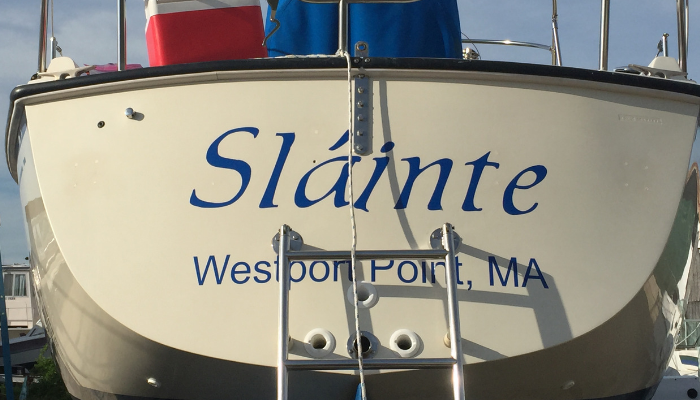 Does your boat name have an Irish backstory? Chime in on Facebook to tell the tale.